Opposition MDC says it is "shocked by blatant disregard of human rights"
HARARE, Zimbabwe (CNN) -- A Zimbabwean court Tuesday ordered 18 human rights and political activists back to jail after they were indicted on charges related to an alleged plan to topple President Robert Mugabe. 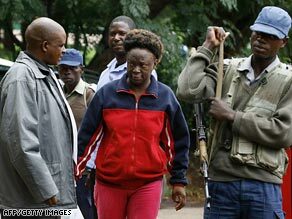 Human rights activist Jestina Mukoko is one of 18 held over an alleged plot to topple Zimbabwean president Robert Mugabe. Critics warn the move could threaten the fragile power-sharing government formed in February between Mugabe and Prime Minister Morgan Tsvangirai, the leader of the opposition Movement for Democratic Change (MDC) after contested elections last year. The court order sent freelance journalist Andrison Manyere, prominent human rights activist and former journalist Jestina Mukoko and 16 other MDC activists back to prison, revoking an agreement with state prosecutors in March which had granted them bail. Harare magistrate Catherine Chimanda said in her ruling Tuesday that her court had no jurisdiction to hear any defense appeal against the indictments. "The law says if accused persons have been indicted, they must remain in custody," Chimanda's ruling said. "Therefore the accused will remain in custody awaiting their trial date." A political settlement signed by Mugabe and Tsvangirai had included a clause for the release of political detainees, most of whom had been in custody since October last year on charges of committing crimes of banditry and terrorism related to the purported plan to overthrow Mugabe. The MDC said in a statement Tuesday it was "shocked by the blatant disregard of human rights" shown by the order to remand the activists back into custody. "Today's ruling is a clear signal that there are some elements within government and Zanu PF (the ruling party) who are against the implementation of the Global Political Agreement (GPA) and the wishes of the majority of the people of Zimbabwe," the MDC statement said. The GPA is the accord guiding the inclusive government. The attorney for Mukoko, Beatrice Mtetwa, said the magistrate contradicted her earlier position to allow the defense to call officers from the Joint Monitoring and Implementing Committee (JOMIC), who were set to confirm the political arrangement that led to the release of the human rights and political activists from custody. "The magistrate has in effect stopped the defense from leading evidence showing that the parties ought to be out on bail in terms of the consent agreement that was reached. This is a clear attempt to scuttle the defense from leading evidence," said Mtetwa. "There can be no question that the whole process is being handled maliciously," she added. She said the defense would file fresh bail applications in the High Court, as well as a Supreme Court application to determine whether the rights of the accused had been infringed. The inclusive government hangs in the balance with the latest development, as well as a series of clashes emerging between the coalition partners. Mugabe and Tsvangirai are scheduled to hold crisis talks soon to salvage the loose coalition from imminent demise.